It can't be an accident Google decided to release Android 4.4 KitKat on Halloween. Nestle had to have a hand in that one. Regardless of the cross-promotional appeal, Google has outlined the mobile OS upgrade it first announced in September. It's available out-of-the-box on the Nexus 5 smartphone, a device that finally showed its face today. 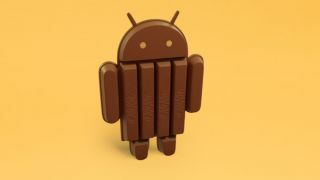 Users of other devices, namely the Nexus 4, Nexus 7, Nexus 10, the Samsung Galaxy S4, and the HTC One Google Play edition, will get access to Android KitKat "in the coming weeks," according to Google. The Nexus 5, meanwhile, is up for order right now at the Google Play Store and will be sold through Carphone Warehouse, Sprint, T-Mobile, Amazon, Best Buy and RadioShack soon. Android 4.4 is a minor upgrade over Android 4.3, though it marks a departure from the Jelly Bean name of old. Google today called it "a smarter, more immersive Android experience" that will reach "even more people." Among the changes with the new OS are a cleaner look and less cluttered feel, including a new immersive mode that hides all functions except what you're doing, whether that's reading a book, playing a game or watching a movie. The phone app has also been redesigned to make it easier to search for contacts across apps and services. The new phone app will prioritize contacts based on who you talk to the most. In a nifty little trick, the caller ID function will now search for matches to businesses with a local listing when users get a call from a number not saved to their contacts. And just like we heard previously, SMS and MMS messages have been rolled into the Hangouts app. Other changes include full-screen album art during music playback, faster multi-tasking (thank goodness), and new voice command options. That new voice command lets users simply state "OK Google" to launch voice search, send a text, get directions or even play a song. The command will work when a users on the home screen or using Google Now. There are even more features Google doesn't highlight front and center on its official Android 4.4 page, including improvements to and expansions of NFC, Bluetooth and IR support. Android devices on KitKat can be used as Infrared remote controls, and NFC can be accessed on any carrier, since it no longer needs to access devices' secure elements. There are other minor improvements, like audio scrubbing from the home screen, changes to the email and download apps, closed captioning and Chromecast support, not to mention Nexus 5-specific improvements like HDR+ photography and faster touch responsiveness. As expected, there's a features called Google Cloud Print which lets users print photos, documents and web pages from their phone or tablet. Google has also gone to lengths to ensure Android 4.4 will work well with low-end devices, including those with less memory. "Building a platform that makes mobile phones accessible for everyone has always been at the heart of Android," wrote Google's Senior Vice President of Android, Chrome & Apps Sundar Pichai in today's announcement. With KitKat, the company has reduced the OS' overall memory footprint, as well as the memory used by Google services like Chrome and YouTube. Pichai wrote that Android 4.4 can "run comfortably" on devices with as little as 512MB of RAM, making it an easy upgrade for the budget handsets of the world. Android 4.4 KitKat is here - now go celebrate Halloween and get some treats! Here's how TechRadar reacted to the Google Nexus 5 announcement.